COMPASSION: Gandhi established a committee of medical volunteers to treat African Zulu soldiers wounded in conflict after their noncompliance with a British tax on the Zulu people. COLLABORATION: Gandhi formed the Natal Indian Congress in 1894 to fight discrimination against Indian immigrants in South Africa. Through organizing, the congress gathered the support of over 10,000 Indian immigrants to sign petitions and support anti-discrimination movements. RESPECT: Gandhi did not eat meat because he did not believe in harming living creatures. CELEBRATION: When Gandhi opened his ashram, he invited people of all castes to come practice religion together. ”In a gentle way, you can shake the world." Nonviolent Resistance in India and South Africa. Helping to achieve India’s Independence from Great Britain. Mohandas “Mahatma” Gandhi was born in Porbandar, India in 1869 to family of the Baniya Caste, a social class of merchants, bankers, and commercial spice dealers. His caste was one of the poorer social groups in his country. He was a very energetic child who loved to read India’s legendary stories. He was inspired by the brave characters who went on long journeys to show devotion to family and spirituality. He was a shy child. He was often tongue-tied and nervous to talk. He considered books to be his companions. Gandhi’s mother and father came from two different religious backgrounds, but they both practiced a form of Hinduism. His mother was also influenced by Jainism, an extremely moral Indian religion that practices non-violence, fasting, meditation and vegetarianism. She did not believe in harming any living creature, even for food, and this influenced Gandhi from a very young age. Gandhi got married at age thirteen, which was common for people of his social class to do. His parents wanted him to become a lawyer, so he studied hard and was accepted into a university in England. After law school, Gandhi returned to India. He was twenty-two years-old. He set up a law practice, but soon accepted a job that sent him to South Africa. At the time, both India and South Africa were British colonies, meaning they were under British rule. Ghandi was happy to have a good job, but when he got to South Africa, he was appalled by how much racism he experienced as an Indian immigrant. Once, Gandhi was on a train in the first class section. He had paid full-price for his ticket, but a train official tried to force Mahatma to give up his seat to a European passenger. Gandhi refused to move, and he was thrown off the train and beaten up. This moment was the birth of Gandhi’s movements. 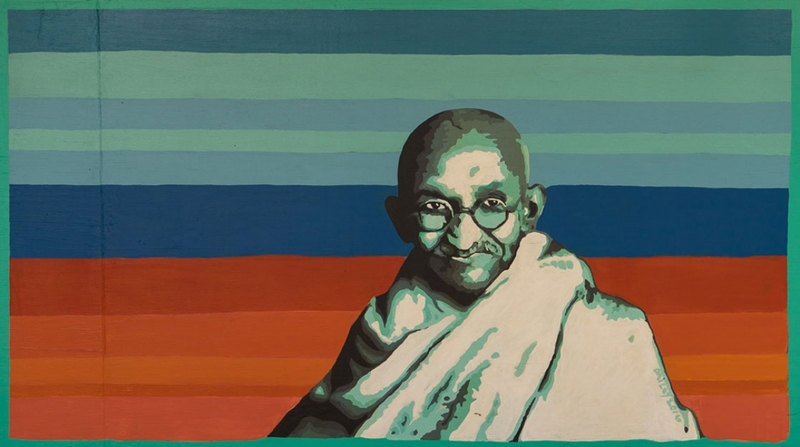 It was a turning point for the young lawyer, who soon began to develop and teach satyagraha, or “truth and firmness.” This concept was created by Gandhi. It was his foundation for using nonviolent civil disobedience to bring about social change. Even though Gandhi wanted to change society, South African laws continued to favor Europeans and oppress Indian immigrants. For example, Indian immigrants had to pay extra taxes in order to vote and their marriages were not legally recognized in South Africa. Gandhi, using satyagraha, led an eight-year-long campaign against these laws. Soon, however, Gandhi noticed that the discrimination he experienced in South Africa was also happening in India. The British government still had rule over the Indian people, and they passed oppressive laws allowing Indian citizens to be imprisoned without fair trial. Also, the British imposed their own system of public education. This system ignored Indian history and culture altogether. Children were learning to be more British than Indian, and people began to feel that this was wrong. A sense of Indian nationalism, or cultural pride, was growing across India. Indian people wanted to govern themselves. The concept of self-rule, or swaraj, became the goal of many anti-colonial movements. Though some of these movements became violent, Gandhi was a steady advocate of satyagraha. He believed in swaraj, but not in the violence he saw in his country. He began to demonstrate ways that people could resist without fighting. He advocated for boycotts of foreign-made goods and started to make his clothes on his own spinning wheel, which he became famous for carrying around. Even though Gandhi was not fighting with violence, the British government saw him as a traitor. He was arrested and accused of sedition, or encouraging people to act against the government. He pleaded guilty and served time in prison. When he got out, he was saddened by the fighting between Hindus and Muslims, which was a growing religious issue during that time. He publicly fasted, or ceased from eating, to encourage unity between the two groups and protest their unnecessary conflicts. Gandhi took some time off from activism, but returned to public attention with The Great Salt March of 1930. The march, which lasted twenty-five days, was a peaceful protest against the British tax on Indian salt manufacturing and selling. Many of India’s poorest families depended on selling salt which was harvested along the shore of the Indian Ocean. The tax took away Indians’ ability to earn a living, and allowed British people to make more money. This, Gandhi thought, was an attack on Indians’ rights to swaraj or to govern their own lives. Gandhi was sixty years old, but he did not let his age stop him. Wearing little more than a piece of traditional Indian fabric, he led thousands of men and women across India for nearly 250 miles. He encouraged people to stand together and disobey the unfair law. Nearly 60,000 people were arrested for marching and breaking the law, including Gandhi. Eventually, India won its independence in 1947. The British government split the region into two separate countries: India and Pakistan. India was primarily Hindu, and Pakistan was mostly Muslim. Gandhi believed that India would be able to resolve this religious divide, but some extreme Hindus were angered by this. They felt like making peace with Muslims was a betrayal to their religion. In 1948, twelve days after Gandhi’s last peaceful hunger strike, Gandhi was assassinated by a Hindu extremist. He was 78 years-old. The next day, nearly one million people attended his funeral in the streets of New Delhi. His legacy continued with leaders like Cesar Chavez and Martin Luther King Jr.; this legacy lives on through the nonviolent methods used by activists around the world. Standard L3.V.CR.1: Visualize and hypothesize to generate plans for ideas and directions for creating art and design that can effect social change. Standard L3.V.CR.3: Experiment, plan, and make multiple works of art and design that explore a personally meaningful theme, idea, or concept. Standard L3.V.CR.5: Demonstrate in works of art or design how visual and material culture defines, shapes, enhances, inhibits, and/or empowers people’s lives. Standard 7–8.V.CR.3: Develop criteria to guide making a work of art or design to meet an identified goal. Standard 7–8.V.CR.6: Demonstrate willingness to experiment, innovate, and take risks to pursue ideas, forms, and meanings that emerge in the process of art-making or designing. Standard 7–8.E.CO.6: Explain how media artworks and ideas relate to various contexts, purposes, and values, such as democracy, environment, and connecting people and places. Objective: Students will consider how symbols play a powerful part in shaping national identity and politics. They will define the qualities that represent them as individuals, and within a collective community. Students will then design a flag that represents these truths. For homework the night before, have students read The National Flag of India. 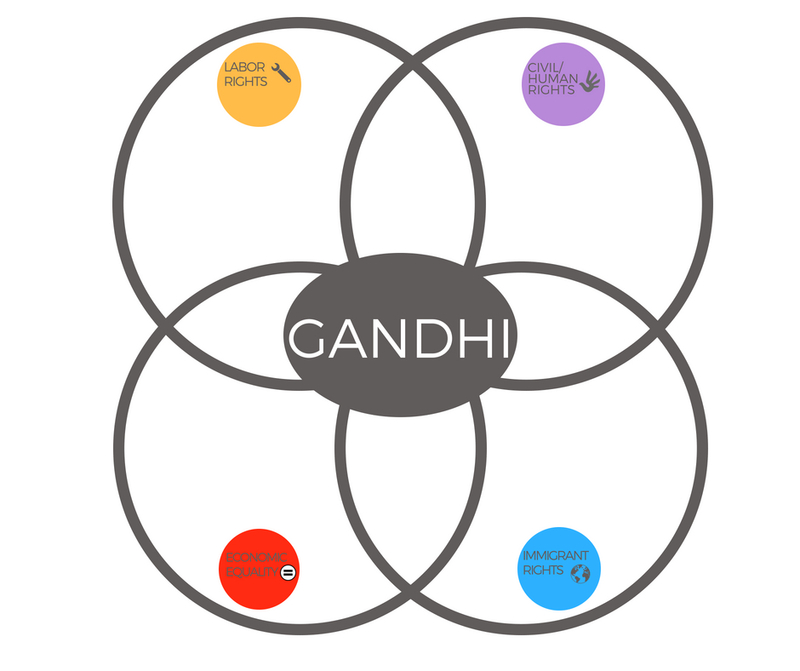 Then, read (and discuss) the biography of Gandhi as a class or in small groups. Show students Margaret Bourke-White’s famous photo of Gandhi and His Spinning Wheel. Lead a discussion about symbols, referring first to the spinning wheel as a symbol of independence from colonial textiles. It represents self-reliance and knowledge. It also looks a little bit like a chakra, or a wheel, which represents forward motion, and therefore progress. When India gained its independence from Britain, the nation needed to come together around a common identity. This was a challenge, and the process did not happen without conflict. Gandhi suggested that the flag bear an image of a spinning wheel, but it was decided that the wheel would be made into a chakra, specifically the Dharma Chakra that represents justice. Ask students what symbols they know of, either in our culture or in others. What do these symbols represent? To encourage discussion, show symbols to class using technology. Symbols might include an eagle, an olive branch, a rainbow flag, an equal sign, a peace sign, religious symbols, bathroom signs, public transportation symbols, caduceus (medical staff), and more. Have students brainstorm a list of qualities and identities that represent the “truth” of who they are. Give them 10 minutes to draft a quick sketch of a flag on the smallest piece of paper. Ask for volunteers to share their flags, then give students 5 more minutes to finish their work. Next, divide the class into four groups. Ask them to share their individual identities with their groups and interpret the symbols on their individual flags. Then, explain to student groups that they are now part of a new country. They must now come up with a new flag with new and/or existing symbols that represents who they are as a collective. What are the common threads between their country’s citizens? What ideals do most people in their country share? Have each “country” share its new flag and explain how they decided upon their new symbols to represent their collective identity. For homework, have students brainstorm how they could combine their class’s four flags into one new flag. Ask them to bring in a list of ideals that the four countries share, and symbols that might represent those ideals. On the largest piece of paper, the students will create a class flag to represent their new collective identity. Which parts of the new class flag do you feel represent your truth? What parts of your truth were left out in the process of becoming part of a new national identity? What parts of the new flag are you most proud of? What parts are you least proud of? Biographical Film: Gandhi (1982): This film is a respected description of Gandhi’s life and goes quite in depth. 3 hrs 11 min.